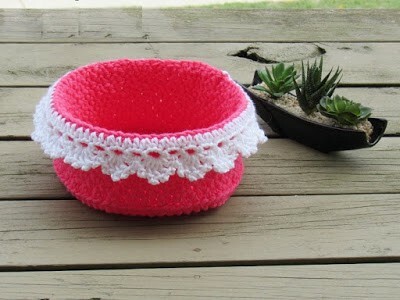 This crochet basket can be used as a bread basket or as a storage basket. 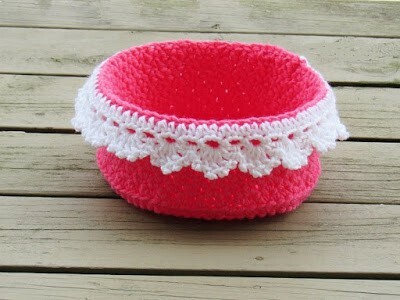 It is worked using 2 strands of worsted weight yarn and a sc stitch variation which makes it sturdy. You can add more rounds to the base and the sides if you want to make it bigger. 1. Worsted weight yarn in 2 colors. 2 strands of Loops and Threads Impeccable in color Abror Rose was used for the main basket, and Red Heart soft was used for the lace. 2. Hook K (6.5mm) was used for the body of the basket and hook I (5.5mm) for the lace. 3.Yarn needle to weave in the ends.